This mosaic image shows part of the left side of NASA’s Curiosity rover and two blast marks from the descent stage’s rocket engines. The images that were used to make the mosaic were obtained by the rover’s Navigation cameras on Aug. 7 PDT (Aug. 8 EDT). The rim of Gale Crater is the lighter colored band across the horizon. The back of the rover is to the left. The blast marks can be seen in the middle of the image. 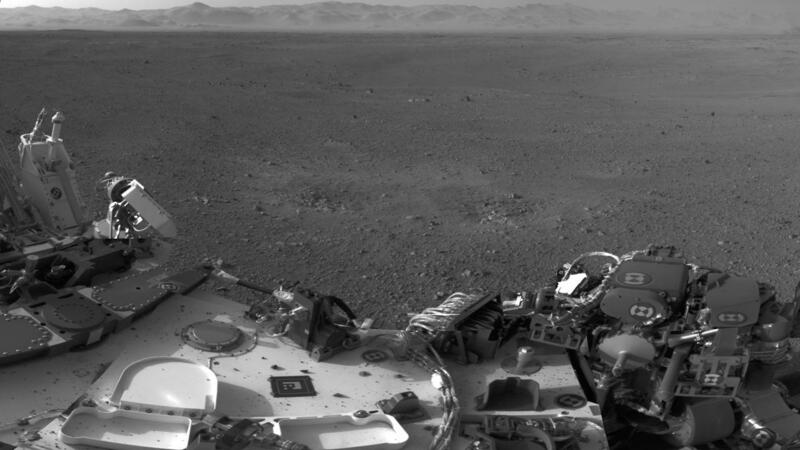 Several small bits of rock and soil, which were made airborne by the rocket engines, are visible on the rover’s top deck.